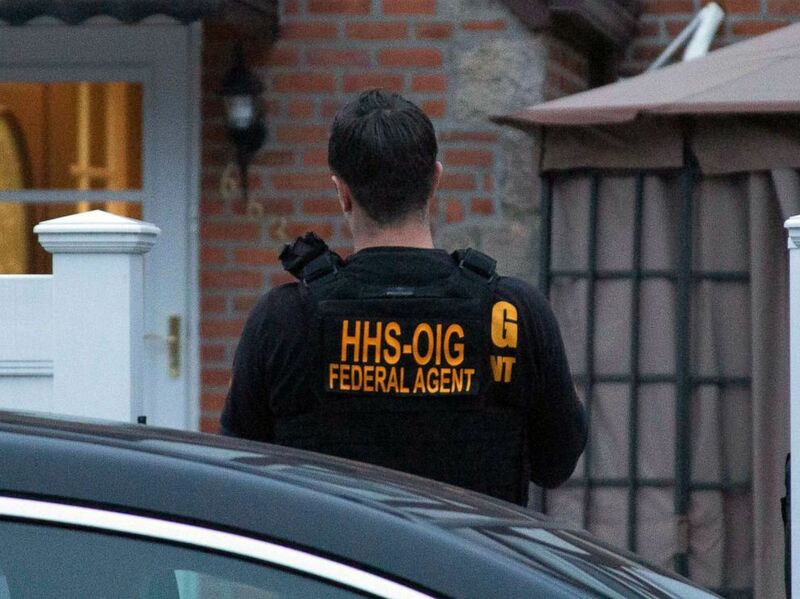 The federal government on Tuesday raided dozens of locations belonging to doctors and medical equipment companies suspected of taking part in a massive telemarketing scam that targeted Medicare recipients and cost taxpayers nearly $1 billion. Investigators said 24 people were charged in the fraud, including three licensed medical professionals as well as company CEOs. The scam relied on telemarketers scattered throughout the Philippines and Latin America who sought out elderly patients eligible for Medicare, the federal health insurance program for older Americans. Using television and radio ads, as well as cold calls, the companies promised a "free or low-cost" brace for a patient's back, shoulder, wrist or knee. Once the scammer obtained a person's insurance information, the companies would bill Medicare and mail the patients unnecessary orthotic braces -- sometimes four or five -- giving kickbacks to the doctors who wrote prescriptions over the phone. “Unscrupulous doctors, unscrupulous durable medical equipment company owners, these marketing firms, their only interest is in the paycheck -- is in that taxpayer dollar that's being stolen," said Gary Cantrell, deputy inspector general for investigations of the Department of Health and Human Services Office of the Inspector General. Federal officials said the scam was one of the largest health care fraud schemes ever investigated, involving more than 80 search warrants in 17 federal districts. The people being charged reside all across the country, including in Florida, New Jersey, Texas, North Carolina, South Carolina, California and New York. Officials said the illegal profits were laundered through international shell companies to buy exotic cars, yachts and luxury real estate worldwide. The Justice Department announced the arrests Tuesday as part of the investigation led by the HHS watchdog office. Scams involving durable medical equipment are not uncommon, but officials say this latest scheme was particularly alarming because it involved so many people across the country and abroad, and because it relied on licensed medical professionals to write bogus scripts. After verifying their Medicare status, officials said the marketers directed the patient to a remote telemedicine firm for a doctor’s consultation. Without setting eyes on the patient or reviewing the patient’s medical history to determine if the brace was medically necessary, the doctor would submit a prescription to the call center and Medicare would be billed, federal officials said. “That's the fraud. It's equipment they don't even need," Cantrell said. “Often in our interviews with patients, we find this equipment in the closet. It's not even being utilized because it was never needed to start with." The cost of each medically unnecessary brace? Anywhere between $500 to $900. The call center would receive a kickback of $289 per brace and the medical equipment company would get to keep the rest of the reimbursement, officials said. Some 130 durable medical equipment companies were accused of submitting over $1.7 billion in claims, resulting in the $900 million payouts, according to investigators. 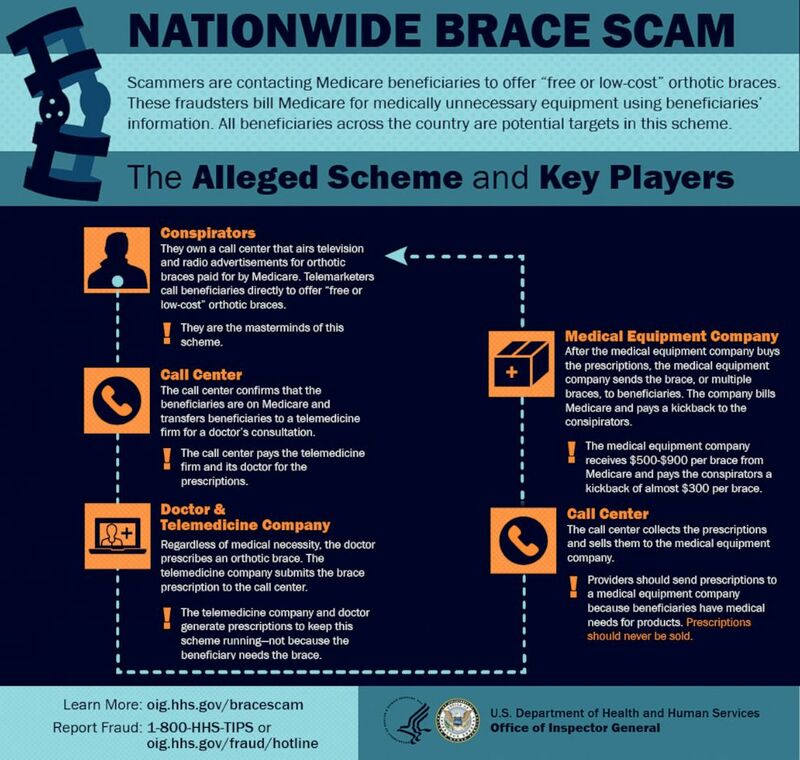 A graphic released by the U.S. Department of Health and Human Services shows how an alleged nationwide Medicare scam worked. “These defendants — who range from corporate executives to medical professionals — allegedly participated in an expansive and sophisticated fraud to exploit telemedicine technology meant for patients otherwise unable to access health care,” Brian A. Benczkowski, assistant attorney general of the Justice Department’s Criminal Division, said in a news release Tuesday. The scheme did not go unnoticed by consumers. In the first three months of the year alone, a government hotline received nearly 1,800 complaints that investigators believe might be connected to the fraudulent sale of durable medicare equipment, according to the HHS Inspector General office. When asked how the government was tipped off, Cantrell said information came through multiple channels, including data analytics, as well as patients who catch on to the scheme and insiders who cooperated with investigators. 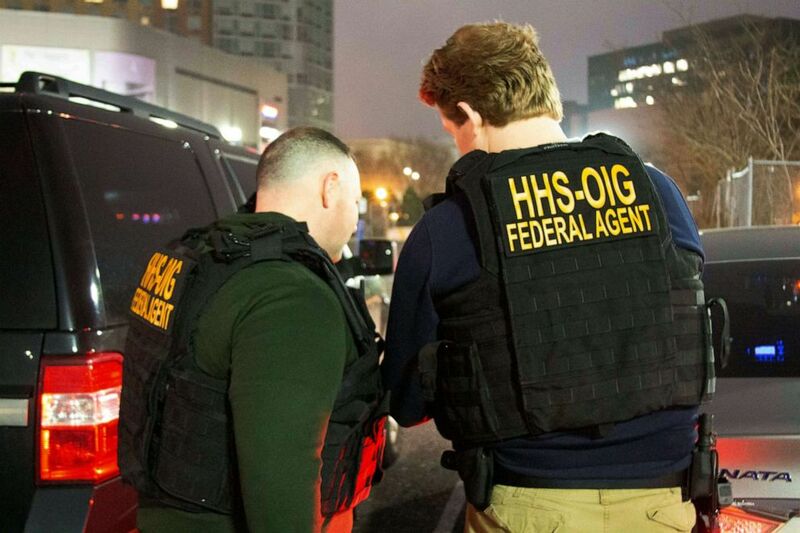 HHS Office of Inspector General agents take part in arrests on April 9, 2019, in Queens, N.Y., as they break up a billion-dollar Medicare scam that peddled unneeded orthopedic braces to hundreds of thousands of seniors nationwide. Health care fraud isn’t new. The U.S. Government Accountability Office added Medicare to its list of programs at high risk for fraud, waste, abuse and mismanagement in 1990, and found that improper Medicare payments reached an estimated $48 billion in fiscal year 2018, according to the office’s website. Since its creation in 2007, the Medicare Fraud Strike Force has charged nearly 4,000 defendants who have collectively billed the Medicare program for more than $14 billion, according to Tuesday’s news release. Last year, the Justice Department charged some 600 defendants for schemes linked to the overprescription of opioids and defrauding insurance providers more than $2 billion. "This is a very important first step in trying to tackle this," Cantrell said.